Paul Eltzbacher (18 February 1868 – 25 October 1928) was a German law student whose professorial appointment was due, largely, to his PhD on anarchism, which became the basis for the present book, first published in English in 1907. ‘Anarchism’ is an overview consisting of seven chapters which deal, principally, with Eltzbacher’s academic take on the various elements and trends of anarchism as defined by the leading anarchist thinkers of the time: Godwin, Proudhon, Stirner, Bakunin, Kropotkin, Tucker, Tolstoy. Every person who examines this book at all will speedily divide its contents into Eltzbacher’s own discussion and his seven chapters of classified quotations from Anarchist leaders; and, if he buys the book, he will buy it for the sake of the quotations. I do not mean that the book might not have a sale if it consisted exclusively of Eltzbacher’s own words, but simply that among ten thousand people who may value Eltzbacher’s discussion there will not be found ten who will not value still more highly the conveniently-arranged reprint of what the Anarchists themselves have said on the cardinal points of Anarchistic thought. Nor do I feel that I am saying anything uncomplimentary to Eltzbacher when I say that the part of his work to which he has devoted most of his space is the part that the public will value most. And yet there is much to be valued in the chapters that are of Eltzbacher’s own writing,—even if one is reminded of Sir Arthur Helps’s satirical description of English lawyers as a class of men, found in a certain island, who make it their business to write highly important documents in closely-crowded lines on such excessively wide pages that the eye is bound to skip a line now and then, but who make up for this by invariably repeating in another part of the document whatever they have said, so that whatever the reader may miss in one place he will certainly catch in another. The fact is that Eltzbacher’s work is an admirable model of what should be the mental processes of an investigator trying to determine the definition of a term which he finds to be confusedly conceived. Not only is his method for determining the definition of Anarchism flawless, but his subsidiary investigation of the definitions of law, the State, and property is conducted as such things ought to be, and (a good[viii] test of clearness of thought) his illustrations are always so exactly pertinent that they go far to redeem his style from dullness, if one is reading for the sense and therefore cares for pertinence. The only weak point in this part of the book is that he thinks it necessary to repeat in print his previous statements wherever it is necessary to the investigation that the previous statement be mentally renewed. But, however tiresome this may be, one gets a steady progress of thought, and the introductory part of the book is not very long at worst. The collection of quotations, which form three-fourths of the book both in bulk and in importance, is as much the best part as it is the biggest. Here the prime necessity is impartiality, and Eltzbacher has attained this as perfectly as can be expected of any man. 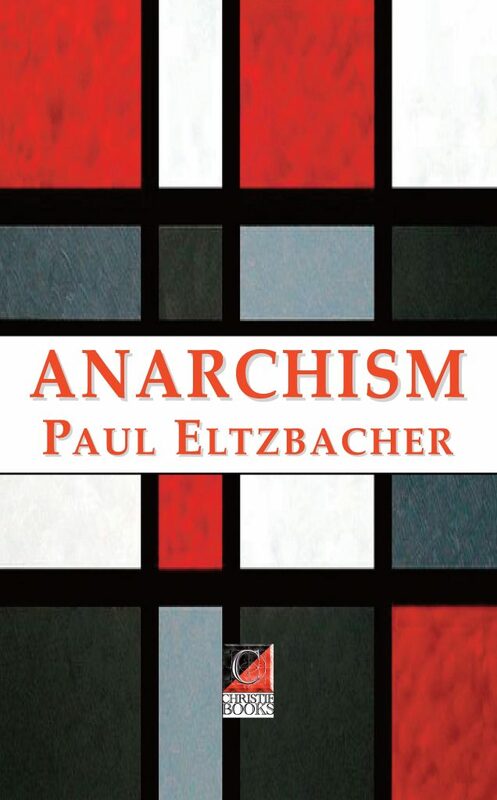 Positively, one comes to the end of all this without feeling sure whether Eltzbacher is himself an Anarchist or not; it is not until we come to the last dozen pages of the book that he lets his opposition to Anarchism become evident. To be sure, one feels that he is more journalistic than scientific in selecting for special mention the more sensational points of the schemes proposed (the journalistic temper certainly shows itself in his habit of picking out for his German public the references to Germany in Anarchist writers). Yet it is hard to deny that there is legitimate scientific importance in ascertaining how much of the sensational is involved in Anarchism; and, on the other hand, Eltzbacher recognizes his duty to present the strongest points of the Anarchist side, and does this so faithfully that one often wonders if the man can repeat these words without feeling their cogency. So far as any bias is really felt in this part of the book it is the bias of over-methodicalness; now and then a quotation is made to go into the classification at a place where it will not go in without forcing, and perspective is distorted when some obiter dictum that had never seemed to its author to be worth repeating a second time is made to serve as illuminant now for this division of the “teaching,” now for that, till it seems to the reader like a favorite topic of the Anarchist. However, the bias of methodicalness is as nearly non-partisan as any bias can be, and its effect is to put the matter into a most convenient form for consultation and comparison. Next to impartiality, if not even before it, we need intelligence in our compiler; and we have it. Few men, even inside the movement, would have been more successful than Eltzbacher in picking out the important parts of the Anarchist doctrines, and the quotations that will show these important parts as they are. I do not mean that this accuracy has not exceptions—many exceptions, if you count such things as the failure to give due weight to some clause which might restrict or modify the application of the words used; a few serious exceptions, of which we reap the fruit in his final summary. But in admitting these errors I do not retract my statement that Eltzbacher has made his compilation as accurate as any man could be expected to. More than this, it may well be said that he has, except in three or four points, made it as accurate as is even useful for ordinary reading; he has overlooked nothing but what his readers would have been sure to overlook if he had presented it. As a gun is advertised to shoot “as straight as any man can hold,” so Eltzbacher has, with three or four exceptions, told his story as straight as any man with ordinary attention can read. The net result is that we have here, without doubt, the most complete and accurate presentation of Anarchism that ever has been given or ever will be given in so short a space. If any one wants a fuller and more trustworthy account, he will positively have to go direct to the writings of the Anarchists themselves; nowhere else can he find anything so good as Eltzbacher. Withal, this main part of the book is decidedly readable. Eltzbacher’s repetitiousness has no opportunity to become prominent here, and the man is not at all dull in choosing and translating his quotations. On the contrary, his fondness for apt illustrations is a great help toward making the compilation constantly readable, as well as toward making the reader’s impressions of the Anarchistic teachings vivid and definite. I do not mean to say that this book can take the place of a consultation of the original sources. For instance, the Bakunin chapter follows next after the Stirner chapter; but the exquisite contrariness of almost every word of Bakunin to Stirner’s teaching can be appreciated only by those who have read Stirner’s book—Eltzbacher’s quotations are on a different aspect of Stirner’s teaching from that which applies against Bakunin. (Stirner and Bakunin, it will be noted, are the only Anarchist leaders against whom Eltzbacher permits himself a disrespectful word before he has presented their doctrines.) It is to be hoped that many who read this book will go on to examine the sources themselves. Meanwhile, here is an excellent introduction, and the chronological arrangement makes it easy to watch the historical development and see whether the later schools of Anarchism assail the State more effectively than the earlier. I have not reserved any expressions of praise for the small part of the book which comes after the compiled chapters, because it calls for none. All Eltzbacher’s weak points come out in this concluding summary; the best that can be said for it is that it deserves careful attention, and that the author continues to be oftener right than wrong. But now that he has gathered all his knowledge he wants it to amount to omniscience, and most imprudently shuts his eyes to the places where there is nothing under his feet. He charges men with error for not using in his sense a term whose definition he has not undertaken to determine. He accepts all too unquestioningly such statements as fit most conveniently into his scheme of method. His most glaring offence in this direction is his classification of the Anarchist-Communist doctrines as mere prediction and not the expression of a will or demand or approval or disapproval of anything, simply because the fashionableness of evolutionism and of fatalism has led the leaders of that school to prefer to state their doctrine in terms of prediction. Eltzbacher has forgotten to compare his judgment with the actions of the men he judges; solvitur ambulando; if Kropotkin’s proposition were merely predictive and not pragmatic, it would have less trouble with the police than it has. Again, he does one of the most indiscreet things that are possible to a votary of strict method when he asserts repeatedly that he has listed not merely all that is to be found but all that could possibly exist under a certain category. For instance, he declares that every possible affirmative doctrine of property must be either private property, or common property in the wherewithal for production and private property in the wherewithal for consumption, or common property. Why should not a scheme of common property in the things that are wanted by all men and private property in the things that are wanted only by some men have as high a rank in the classification as has Eltzbacher’s second class? A look at the quotations from Kropotkin will show that I have not drawn much on my own ingenuity in conceiving such a scheme as supposable. He claims to have listed all the standpoints from which Anarchism has been or can be propounded or judged, yet he has omitted legitimism, the doctrine that a political authority which is to claim our respect and obedience must appear to have originated by a legitimate foundation and not by usurpation. The great part that legitimism has played in history is notorious; and it lends itself very readily to the Anarchist’s purpose, since some governments are so well known to have originated in usurpation and others are so easily suspected of it. Nay, legitimism is in fact a potent factor in shaping the most up-to-date Anarchism of our time; for it is largely concerned in Lysander Spooner’s doctrine of juries, of which some slight account is given in Eltzbacher’s quotations from Tucker. And he claims to have recited all the important arguments that sustain Anarchism: where has he mentioned the argument from the evil that the State does in interfering with social and economic experimentation? or the argument from the fact that reforms in the State are necessarily in a democracy, and ordinarily in a monarchy, very slow in coming to pass, and when they do come to pass they necessarily come with all-disturbing suddenness? or the argument from the evil of separating people by the boundary lines which the State involves? or the fact that war would be almost inconceivable if the States were replaced by voluntary and non-monopolistic organizations, since such organizations could have no “jurisdiction” or control of territory to fight for, and war for any other cause has long been unknown among civilized nations? By these and other such unwarranted claims of absolute completeness, and by the conclusions based on these pasteboard premises, Eltzbacher makes it necessary to read his final chapters with all possible independence of judgment. Of Godwin’s “Political Justice” I used an American reprint of the second British edition. This second edition is greatly revised and altered from the first, which Eltzbacher used. Godwin calls our attention to this, and especially informs us that the first edition did not in some important respects represent the views which he held at the time of its publication, since the earlier pages were printed before the later were written, and during the writing of the book he changed his mind about some of the principles he had asserted in the earlier chapters. In the second edition, he says, the views presented in the first part of the book have been made consistent with those in the last part, and all parts have been thoroughly revised. It will astonish nobody, therefore, that I found it now and then impossible to identify in my copy the passages translated by Eltzbacher from the first edition. In particular, I got the impression that what Eltzbacher quotes about promises, from the first part of the book, is one of those sections which Godwin says he retracts and no longer believed in even at the time he wrote the later chapters of the first edition. If so, a bit of the foundation for Eltzbacher’s ultimate classification disappears. Besides giving the pages of the first edition as in Eltzbacher, I have added in brackets the page numbers of the copy I used, wherever I could identify them. Throughout the book brackets distinguish footnotes added by me from Eltzbacher’s own, and in a few places I have used them in the text to indicate Eltzbacher’s deviations from the wording of his original, of which matter I will speak again in a moment. The passages from Proudhon’s works I translated from the original French as given in the collected edition of his “Œuvres complètes.” In this edition some of the works differ only in pagination from the editions which Eltzbacher used, while others have been extensively revised. I know of no changes of essential doctrine. Since in Stirner’s case German is the original language, I have accepted as my original the quotations given by Eltzbacher. It is probable that they are occasionally condensed; but a fairly faithful memory, and the fact that it is less than a year since I was reading the proofs of my translation of Stirner’s book, enable me to be confident that there is no change amounting to distortion. I have here made no use of that translation of mine except from memory, because I well knew that in dealing with Stirner there is no assurance that the best possible translation of the continuous whole will be made up of the best possible translations of the individual parts. Neither have I used the extant English translations of Bakunin’s “God and the State,” Kropotkin’s “Conquest of Bread,” Tolstoi’s works, or any of the other books cited. I have not had at hand any originals of Bakunin or Tolstoi, nor any of Kropotkin except “Anarchist Communism.” Of this I had the first edition, and Eltzbacher, contrary to his habit, the second; but I judge that the two are from the same plates, for all the page-numbers cited agree. and I have tried to have an eye to the precise correctness of everything in that chapter. That I used the original of “Instead of a Book” is a matter of course; and I have not only taken Tucker’s words where Eltzbacher had translated the whole, but have had an eye to all points where Eltzbacher had condensed anything in a way that could affect the sense, and have restored the words that made the passage mean something a little bit different from what Eltzbacher made it mean. (I did about the same in this respect with Kropotkin’s “Anarchist Communism”; and indeed something of the kind is inevitable if one is to consult originals at all.) On the other hand, I have not, in general, drawn attention to passages where Eltzbacher makes merely formal changes for the purpose of inserting in a sentence of a certain grammatical structure what Tucker had said in a sentence of different structure. The renderings of Tolstoi’s biblical quotations are taken from the “Corrected English New Testament,” a conservative version which is now spoken of as the best English New Testament extant. It fits well into Tolstoi, at least so far as the present quotations go. I have spoken above of Eltzbacher’s qualities as compiler; it here becomes necessary to say something of his work as translator. His translation is that of a very intelligent man, trusting to his intelligence to justify him in translating quite freely. He is confident that he knows what the idea to be presented is, and his main concern is to express that in the language best suited to the purpose. He even avows, as will be seen, that he has “cautiously revised” other people’s translations from the Russian, without himself claiming to be familiar with the Russian language. I would as soon entrust this extremely delicate task to Eltzbacher as to anybody I know, for he is in general remarkably correct in his re-wordings. The justification of his confidence in his knowledge of the author’s thought may be seen in the fact that in passages which happen not to affect the main thought he makes a few such slips as zahlen mit ihrer Vergiftung for “pay to be poisoned,” Willkuer for “arbitrament,” and even eine blutige Revolution ruecksichtslos niederwuerfe for “would do anything in his power to precipitate a bloody revolution” (can he have been misled by the chemist’s use of “precipitate”? ), but in passages where these blunders would do real harm he keeps clear of them, being safeguarded by his knowledge of the sense. But it makes a difference whom you translate in this way. Tucker is a man who uses language with especial precision: every phrase in a sentence of his may be presumed to contribute something definite to the thought; and Eltzbacher treats him as if the less conspicuous phrases were merely ornamental work which might safely be omitted or amended when they seemed not to be advantageous for ornamental purposes. I must confess that I have little faith in the Eltzbacher method of translation for the rendering of any author; but it works especially ill with an author like Tucker. Of course all defects of translation are cured, silently, by substituting the original English. Therefore, at the expense of slightly increasing the bulk of the Tucker chapter, this edition gives American readers a much more accurate presentation of the utterances of the American champion of Anarchism than can be had in Eltzbacher’s German; and, since I have the same advantage as regards Godwin, I think I may claim in general terms that mine is the best edition of Eltzbacher for those who read both English and German. Besides looking out for the accurate presentation of the passages quoted from Tucker, I have kept watch of the correctness of the subject-matter. Whatever seemed to me to represent Tucker’s book unfairly, either by misrepresenting his doctrine or by misapplying the quotations, has been corrected by a note. This will be useful to the reader not only by giving him a better Tucker, but also by giving a sample from which he may judge what amount of fault the followers of Kropotkin or Tolstoi or the rest would be likely to find with the chapters devoted to them. The merely popular reader will probably get the impression that Eltzbacher is really a rather unreliable man. The competent student, who knows what must be looked out for in all work of this sort, will have his confidence in Eltzbacher increased by seeing how little of serious fault appears in such a search. The index is compiled independently for this translation. Omitting such entries as merely duplicate the utility of the table of contents, and making an effort to head every entry with the word under which the reader will actually seek it, I hope I have bettered Eltzbacher’s index; and I hope the index will be not only a place-finder but a help toward the appreciation of the Anarchistic teachings. I have not in general undertaken to criticise those features of the book which embody Eltzbacher’s own opinions. Whether it was in fact right to select these seven men as the touchstone of Anarchism,—whether Eltzbacher is right in discussing the definition of the State as he does, or whether he might better simply have taken as authoritative that definition which has legal force in international law,—whether he ought to have added any other feature to his book,—are points on which the reader does not care for my judgment, nor am I eager to express a judgment. Having had to work over the book very carefully in detail, I have felt entitled to express an opinion as to how well Eltzbacher has done the work that he did choose to do; I have also told what work I as translator claim to have done; and it is time this preface ended. Ballardvale, Mass., August 28, 1907.